I’m a sprinter, age 65. Not a 5K/10K road racer or marathoner, but a sprinter. I started running as a kid, encouraged by my dad, and found that I was good at it. I did other sports growing up, and eventually did road races, as many adults do. 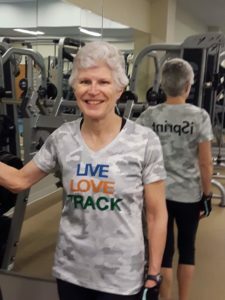 But when I found, at about age 50, that adults could also do track events, I was excited to try it, found a coach, and never looked back. I race in events such as 50m, 60m, 100m, 200m and 400m races, indoors and outdoors. 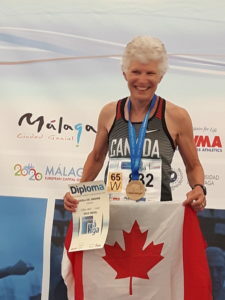 I presently hold 24 Canadian and 6 World records in these events in several age categories, and was named World Masters Athletics Female Sprinter of the Year for 2018. 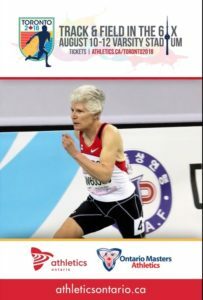 Masters compete in 5 year groups, and there are events in Ontario (run by Ontario Masters Athletics), across Canada, and internationally. I’ve competed in Puerto Rico, Brazil, Austria, Finland, Italy, Hungary, and Spain. In 2020, the World Masters Athletics event will be hosted in Toronto. cross-country meets, and still do some coaching today where I train at Variety Village in Toronto. Please share a story about an internal or external barrier you have faced? How did you overcome that barrier? 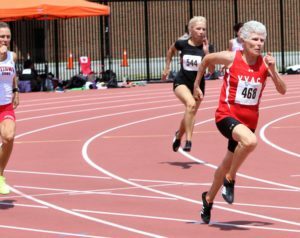 It’s not usual for women my age to sprint, as most people think that’s just for kids. I like to push the barriers to show what women age 50, 60, and upwards can do. Sometimes I race with younger athletes, and I train with high school girls. I make sure they understand that I love to run just like they do, and that once you find your passion, why not continue it as long as you can? There are women ahead of me competing in all track and field events … hurdles, high jump, pole vault, long jump, shot put, etc. … not just running. I want to stay fit and healthy and enjoying life, as my role models do. 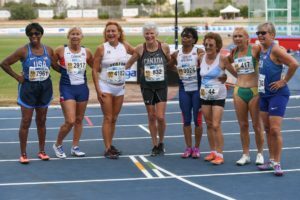 So my passion for running, my drive to defy expectations and to follow in the footsteps of other older athletic women, is what drives me to continue and overcome the barrier of getting older! What skills did you develop in sport to help you overcome your barrier? When I was teaching, I encouraged my students to find their own passion – dance, soccer, music, art, math, whatever! – anything that they could become good at and see where it would lead. 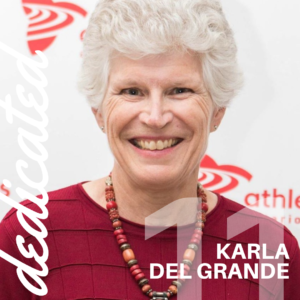 I emphasized with my students that running is a lifelong activity that’s a good basis for many other sports, and good for one’s fitness, and I hopefully inspired them by my example. My sport requires many skills that I had to develop, and I let my students know that. My training includes yoga, Pilates, learning to focus, time management, pool running, weight training, growing one’s confidence, paying attention to nutrition and sleep, etc., and that it takes work to achieve success, not just raw talent. “Hard work beats talent, when talent doesn’t work hard,” I would say. So developing any passion is multi-faceted, and takes your whole being – body, mind and spirit. Attention to all these aspects is what will help a person keep growing, learning, and enjoying life! I think of myself as dedicated … because combining all these aspects of developing my passion requires it. It’s important to realize that one must put effort into following a passion, and that it has benefits in all aspects of life, for one’s entire lifetime.